TiO2(200)-rGO hybrid nanosheets were synthesized starting from TiO2, rGO and NaOH solid powders via a scalable hydrothermal process. The weight ratio of TiO2-GO was found to be crucial on the crystal growth and biosensor properties of the final hybrid nanosheets. They were characterized by means of SEM, FESEM-EDX, XRD, XPS, Raman and FTIR spectroscopies in order to verify the formation of very thin TiO2 anatase nanosheets with an orientation of the anatase crystal structure towards the (200) plane. The free active sites of TiO2 structure and the large surface of the 2D graphene structure strongly facilitate charge transport confirmed by BET-BJH analyses. 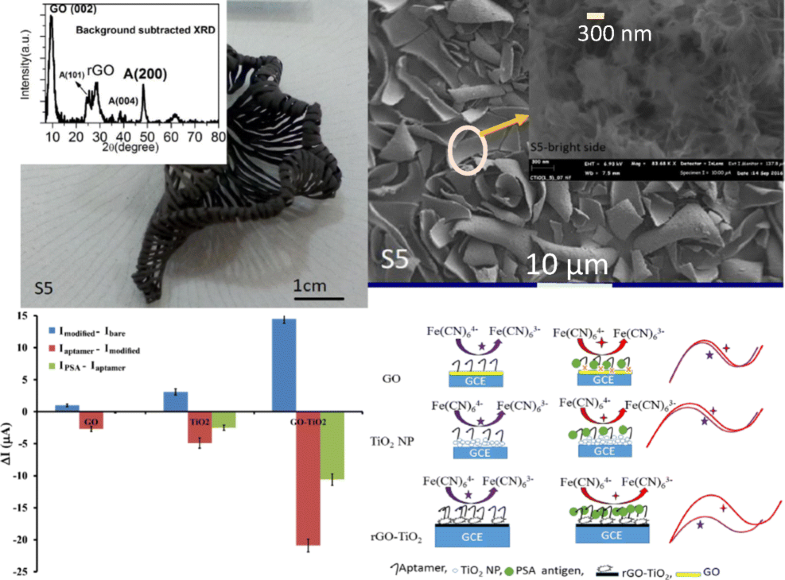 Compared to pure AuNPs, rGO and TiO2, the hybrid nanosheet modified electrode represents the most sensitive aptasensing platform for the determination of PSA. The detection was based on that the variation of electron transfer resistance (Rct) at the modified electrode surface in a solution containing 3.0 mmol L−1 [Fe(CN)6]3−/4- as a redox probe and 0.1 mol L−1 KCl as supporting electrolyte. The detection limit of the sensor is 1 pg mL−1, and the sensor can be operated up to 30 days. It was applied to the analysis of PSA levels in spiked serum samples obtained from patients with prostate cancer. Data compare well with those obtained by an immunoradiometric assay. 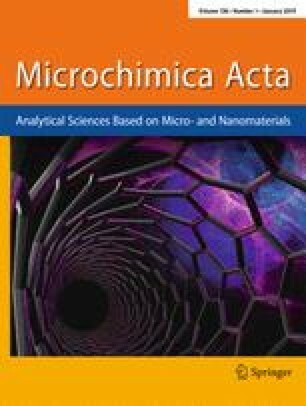 Scalable reduced graphene oxide (rGO)-TiO2(200) mesoporous hybrid nanosheets with large surface area and new crystal growth of anatase (A) are introduced as efficient, durable, selective with low detection limit aptamer based prostate specific antigen biosensor. The online version of this article ( https://doi.org/10.1007/s00604-018-3141-7) contains supplementary material, which is available to authorized users.